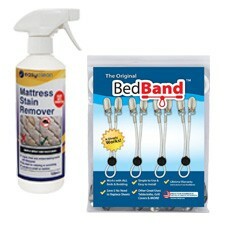 Shop from a selection of mattress cleaning and mattress accessories which have been specially selected to make cleaning easier and to help you get the best out of your mattress and bedding. The range includes cleaning and deodorising products that remove stains, absorb liquids and eliminate odours, and accessories such as BedBands that keep your fitted sheets snug tight on your mattress. Case savers are also on offer to enable you to bulk buy and save money.